Ladies and gentleman, friends, family and loved ones, it’s Arush -to the top- a, “Yaaaayyy!” (team cheers in background). 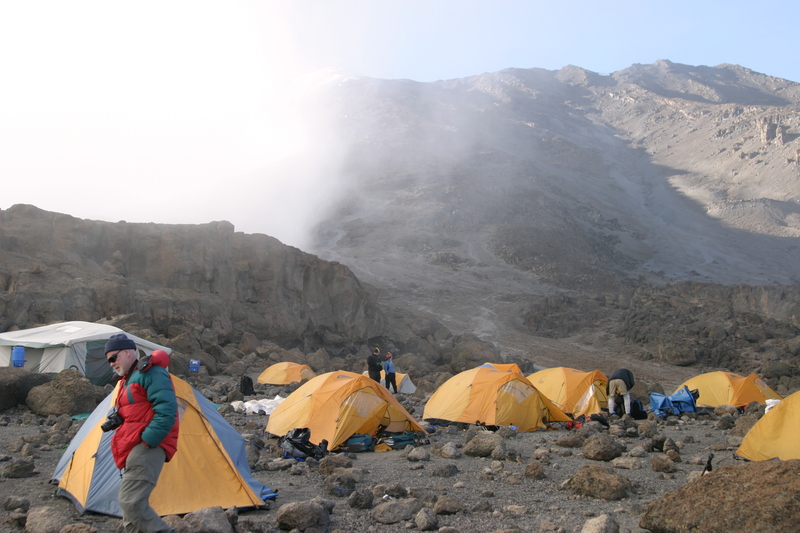 We’re here at High Camp at 15,700 feet, it’s the 12th of July, about 5:30, we’re just wrapping up an early dinner and getting ready to go to bed for a few hours before we wake up and march on up slowly to the roof of Africa, together. We are all here, we’re all doing great, everyone sends their best back home, and we’re looking forward to a great climb tonight. The weather is, as we say in the mountains, “splitter” or perfect, nice and warm today and we’re looking forward to a night with a full moon, and lots of light for our climb. We’re going to leave at midnight and hopefully back here in High Camp by about noon tomorrow, and then we’ll be descending down to our Low Camp for the evening, for our last night on the mountain at Millennium Camp, 12,200 feet. We will give you all a shout from there, until then, wish us luck.